I’ve been getting a little creative in the kitchen recently because I’m trying to use up some spare ingredients before I move. I have a TON of sesame oil (which is weird because I had never used it before this recipe) so I searched for some ways to use it. I found this recipe and altered the recipe a bit to fit the ingredients I already had on hand. The result? Pure, fried, mushroomy bliss. 1) Whip up some of the Soy Sesame Dipping Sauce. It’s really easy and I actually had all of the ingredients on hand! 2) Prepare your tofu by slicing it once width-wise then once so that you cut the bulk by half. See the picture for help deciphering this step! 3) put 2 tbsp. 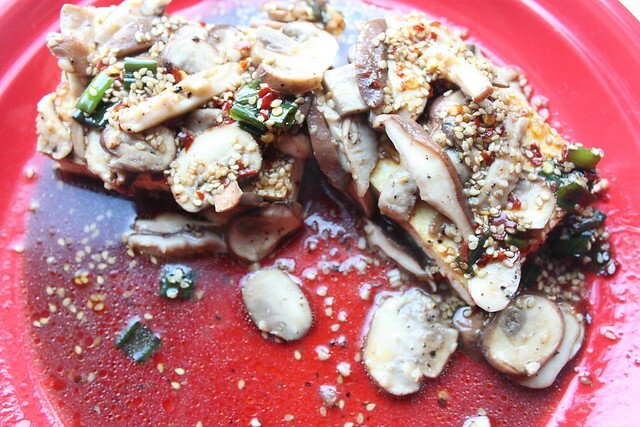 of your oil in the pan then add the mushrooms & garlic. You can also add salt and pepper to taste! Saute until the mushrooms are brown and smell like heaven–you’ll know :). 4) When your mushrooms are finished cooking set them to the side. Throw your remaining oil in the pan and add your tofu. Fry for 2-3 minutes on each side then you’re good to go. 5) I prefer having warm sauce so I threw mine in the microwave for about 25 seconds. 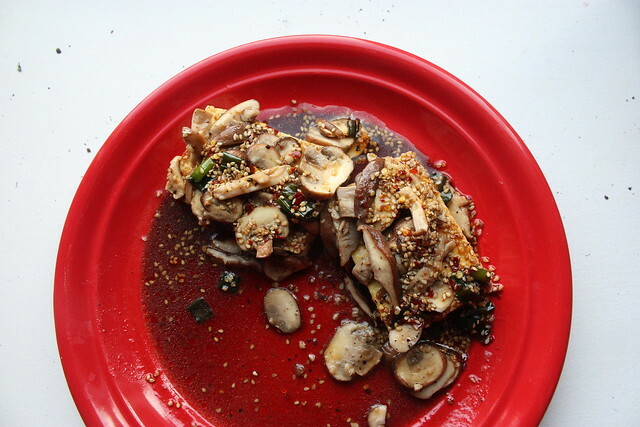 You’re going to want to smother your fried tofu with the mushrooms then you can pour the sauce over your dish and enjoy. It’s delicious!! I hope you enjoy it as much as I did. I made half at a time and ate it for dinner two nights in a row. The cool thing is that the Shiitake mushrooms have a really meaty texture/flavor to them. I don’t eat much meat at home so I liked pretending like I had gone to the trouble of preparing something like that without actually putting in the effort! It looks great! I love mushrooms so much, too so it's perfect!Great job!